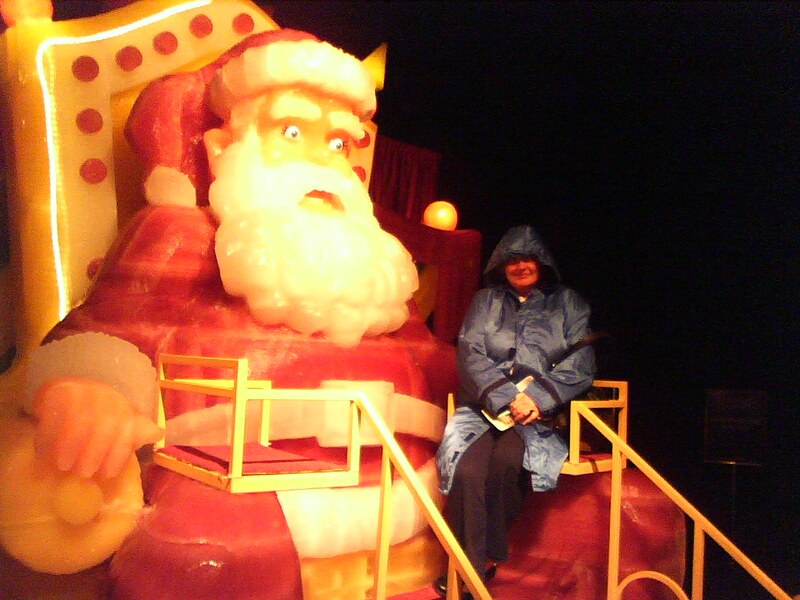 Two million pounds of ice blocks stacked and carved into a wintery wonderland–welcome to the Gaylord Palms Hotel & Convention Center’s annual winter attraction: ICE 2009! Located at the corner of Osceola Parkway and International Drive South right next to the Disney World Resort, this is a spectacle for the entire family. We recommend rounding out your ICE experience by having lunch or dinner at the Villa de Flora–a mediterranean marketplace buffet, also located within the Gaylord Palms Hotel. Stations of fabulous food representing Italy, France, Spain or Greece (depending on which day you visit) in a casual yet elegant all-you-care-to-eat atmosphere makes for a scrumptious day. In addition to ICE and your meal, stroll around the exquisite four acre covered atrium located in the center of the hotel. Snack at the chocolate store, shop for gifts and/or clothing, enjoy the lush, tropical landscaping and water features. ICE is open daily from November 13 to January 3rd. Hours vary by day and prices vary depending on the day of the week and your age; from Free for 3 and under to $28 for adults on the weekend. –It is REALLY cold inside ICE–9 degrees farenheit. They provide you with a parka, but you might want to bring a hat, scarf, gloves and wear long sleeves and long underwear. It costs a lot of money to enjoy ICE, so you don’t want to have to rush through it. –Just to park at the Gaylord Palms costs $12. –If you are like Mrs. LanceAround, you’ll want to walk through quickly and get out of the cold as fast as possible. 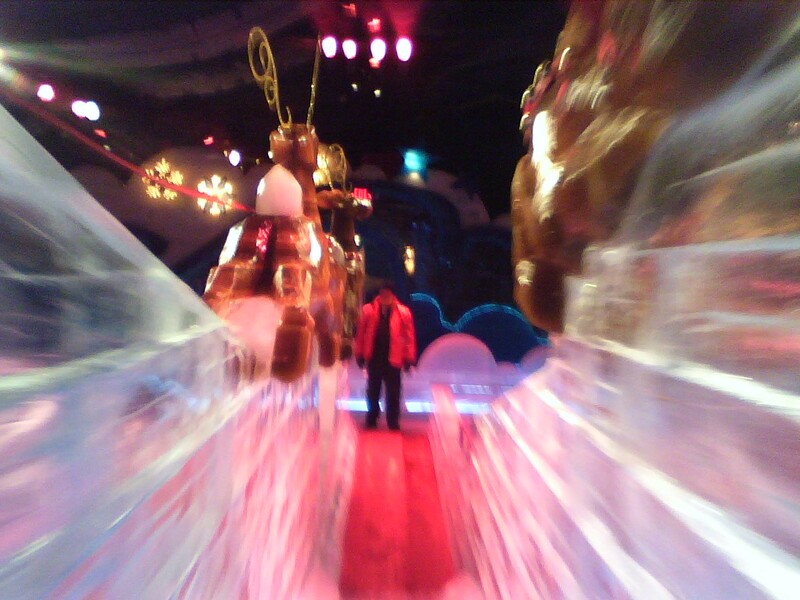 If you’re like me, you’ll want to take your time, examine all the sculptures and enjoy sliding down the ice slides. There is a warm seat at the end of the exhibits for the Mrs. LanceArounds to relax and wait for the hubbies to finish playing! –In addition to the ICE attraction, plan some time to walk through the tropically decorated indoor atrium of the hotel. Enjoy lunch or dinner at one of the hotel restaurants. Bring some extra money for a souvenir at one of several stores inside the atrium. –We enjoyed ICE. But our reactions were a little mixed. 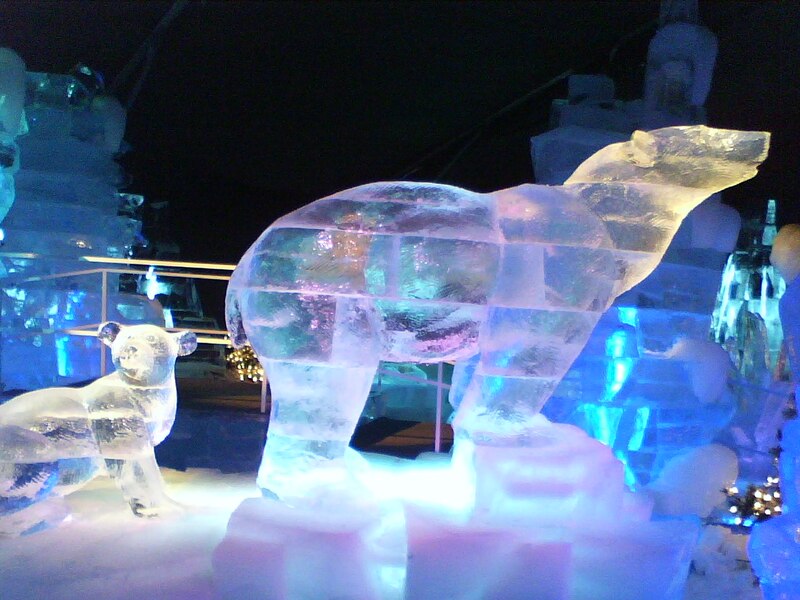 We have seen ice sculptures before that were real works of art; graceful, delicate, beautiful and intricate. 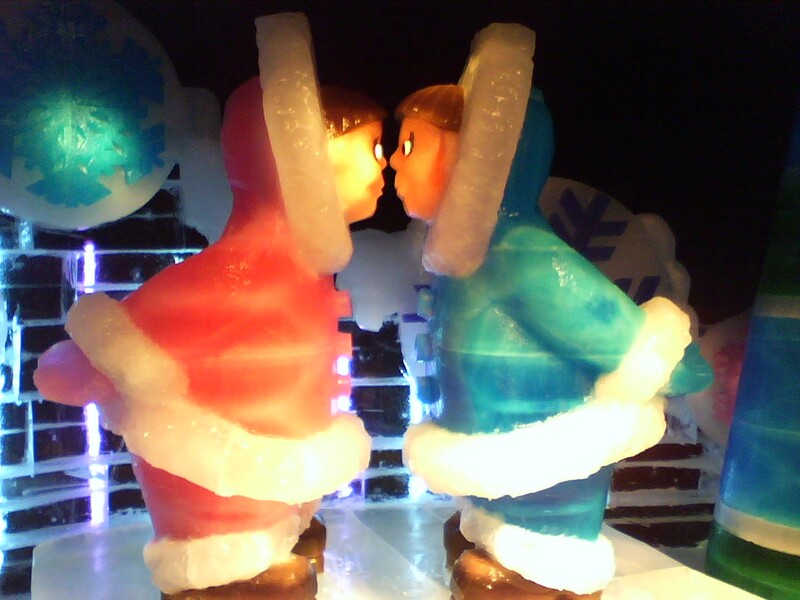 The sculptures in ICE were made from large blocks that were somewhat simplistic. We thought the cost was a little high. Nonetheless, we do recommend that you experience ICE at least once. 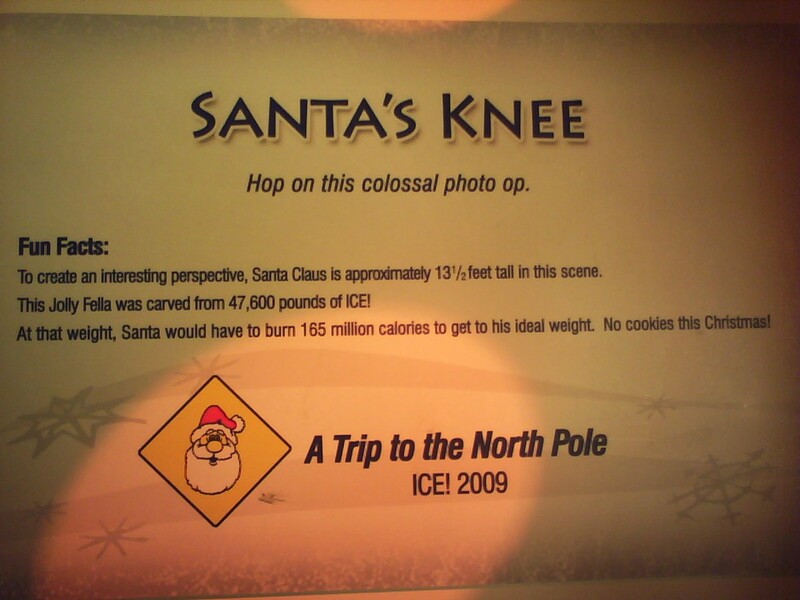 This entry was posted on November 17, 2009 at 5:20 pm and is filed under Special Events. You can follow any responses to this entry through the RSS 2.0 feed. You can leave a response, or trackback from your own site.